Pass CDL Air Brakes Test at DMV! No doubt about it, more people fail on the air brakes section of the Class A CDL than any other part of the test! Anyone who has taken the Class A CDL tests: General Knowledge, Combination Vehicles and Air Brakes, knows the Air Brakes test is the hardest of all the CDL Tests at the DMV. There are two sections of the test where you must master the Air Brakes test questions. First, is obviously the Air Brakes Endorsement Test itself, and second is the Pre-Trip Inspection or Walk Around portion of the Skills Tests. You must memorize the components of the air brake and the spring brake and be ready to discuss how they are used and why. Spring Breaks allow the trailer to stay parked when the tractor is unhooked from it. It is important to recognize the difference between these two types of breaks, and how to operate both a spring break and an air brake. The DMV instructor will expect you to explain the entire breaking system, and they do not help you in any way. 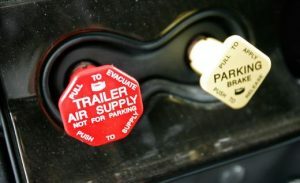 During the walk around or pre-trip inspection with a DMV instructor it is important to know the minimum air pressure the air brakes must have before the Spring Breaks come on automatically. There is a safety mechanism designed into the air brake system. If there is not enough air pressure to stop the truck the spring breaks automatically lock on. Once the air pressure reaches 20-45 psi the spring breaks will engage. It will be important to know how to test the air breaks prior to each trip with a commercial vehicle. The easiest test of the air brakes is the ‘tug test’ apply slight pressure to your breaks and tug with the gas in gear to see if the brakes work. The fastest way to pass the Air Brakes Test at the DMV is to study test questions until you are ready to ace the CDL air brakes test. Think about how you like to study because if you prefer we offer all of the DMV CDL practice tests online. Or if you prefer you can DOWNLOAD an AIR BRAKES TEST as a .pdf (Adobe Reader) file. This way you can save the CDL practice tests to your computer and print them, or email them, etc. Another method we offer is watching our online videos on how to operate a commercial vehicle and the air brakes. By watching these professional truck drivers and instructors explain using Air Brakes, it makes understanding how to pass the air brakes test much easier. Next we have our unique 7-Sterp Air Brakes Check. We built this for students in the CDL School Class rooms to easily memorize 7 Steps so they could always pass both the written and the verbal portions of the Class A CDL Air Brakes questions and Walk-Around Skills Test portions of the CDL test. 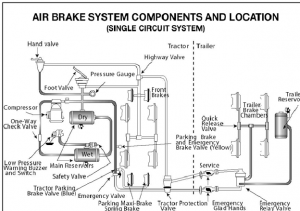 If you can memorize the 7 Step Air Brake Check then you can pass the CDL Class A air brakes questions. If you say it exactly or close to it, they will pass you for DMV air brakes knowledge. You can find the 7 Step Air Brakes Check Here. We always get asked the same question, "How to Pass an Air Brakes Test at the DMV?" Everyone must pass the DMV CDL Skills Test - Pre-Trip Inspection, walk-around, Road Trip, if they want a Class A CDL. The best way to pass is watch our online videos for CDL Skills Tests AND study our CDL practice tests on your own time using our CDL Practice Test Downloads makes printing out the CDL Test questions (air brakes test) easy and convenient for people on the go. 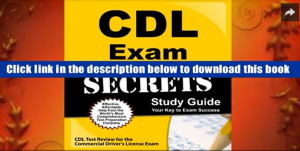 First download the CDL HANDBOOK from the DMV. Know any images / photos and be ready to discuss all the different air brakes parts names. Be prepared to name each Air Brake part and describe what it does. We provide free online CDL practice tests for air brakes endorsement tests at CDL-TEST.com so try a FREE CDL Air Brakes test first to see how much you need to learn, and so you know how the website works. Then sign up as a full member to learn about your state’s local DMV air brakes test questions. You can complete the FREE CDL practice test as many times as needed. But do not forget to sign up for the full membership to get over 2,000 DMV practice test questions and it covers the air brakes components thoroughly. There are many parts to a semi truck or tractor-trailer air brake system. It is important to understand all air brakes parts and what they do. Each name and description must be memorized to pass the CDL Test Air Brakes Endorsement questions. You must study all parts of the Air Brakes to pass the CDL Walk-Around and the Skills Test at the DMV. You must study all parts of the Air Brakes to pass the Pre-Trip Inspections at the DMV. The governor controls when the air compressor will pump air into the air storage tanks. When air tank pressure rises to the "cut-out" level (around 125 pounds per-square-inch or "psi"), the governor stops the compressor from pumping air. When the tank pressure falls to the "cut-in" pressure (around 100 psi), the governor allows the compressor to start pumping again. Check the alcohol container and fill up as necessary, every day during cold weather. Daily air tank drainage is still needed to get rid of water and oil. (Unless the system has automatic drain valves. This picture shows Air tank with Manual Draining Valve for Air Brakes Test - CDL. The picture illustrates Air Tanks Drains using the Manual Draining Valve on bottom of the Air Tank. Automatic--the water and oil are automatically expelled. These tanks may be equipped for manual draining as well. Manually operated by turning a quarter turn or by pulling a cable. You must drain the tanks yourself at the end of each day of driving. Automatic air tanks are available with electric heating devices. This helps prevent freezing of the automatic drain in cold weather. The brakes are applied by pushing down the brake pedal. Pushing the pedal down harder applies more air pressure. Letting up on the brake pedal reduces the air pressure and releases the brakes. Releasing the brakes lets some compressed air go out of the system, so the air pressure in the tanks is reduced. It must be made up by the air compressor. Pressing and releasing the pedal unnecessarily can let air out faster than the compressor can replace it. If the pressure gets too low, the brakes won't work. 8. Foundation Air Brakes – the drum brake air brake component list. 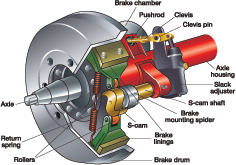 Pass the Air Brake Test and get a CDL – by memorizing all parts of the Drum Brake picture. Drum Brake Air Brakes Parts >> must know on the CDL TEST for Air Brakes Endorsement and on the DMV Skills Test, Road Trip and Pre-trip parts of DMV TEST. Foundation brakes are used at each wheel. The most common type is the s-cam drum brake. Brake Drums, Brake Shoes, and Brake Linings. Brake drums are located on each end of the vehicle's axles. The wheels are bolted to the drums. The braking mechanism is inside the drum. To stop, the brake shoes and linings are pushed against the inside of the drum. This causes friction, which slows the vehicle (and creates heat). The heat a drum can take without damage depends on how hard and how long the brakes are used. Too much heat can make the brakes stop working. When you push the brake pedal, air is let into each brake chamber. Air pressure pushes the rod out, moving the slack adjuster, thus twisting the brake camshaft. This turns the s-cam (so called because it is shaped like the letter "S"). The s-cam forces the brake shoes away from one another and presses them against the inside of the brake drum. When you release the brake pedal, the s-cam rotates back and a spring pulls the brake shoes away from the drum, letting the wheels roll freely again. In air-operated disc brakes, air pressure acts on a brake chamber and slack adjuster, like s-cam brakes. But instead of the s-cam, a "power screw" is used. The pressure of the brake chamber on the slack adjuster turns the power screw. The power screw clamps the disc or rotor between the brake lining pads of a caliper, like a large c-clamp. In this type of brake, the brake chamber push rod pushes a wedge directly between the ends of two brake shoes. This shoves them apart and against the inside of the brake drum. Wedge brakes may have a single brake chamber, or two brake chambers, pushing wedges in at both ends of the brake shoes. Wedge type brakes may be self-adjusting or may require manual adjustment. All vehicles with air brakes have a pressure gauge connected to the air tank. If the vehicle has a dual air brake system, there will be a gauge for each half of the system. (Or a single gauge with two needles.) Dual systems will be discussed later. These gauges tell you how much pressure is in the air tanks. This gauge shows how much air pressure you are applying to the brakes. (This gauge is not on all vehicles.) Increasing application pressure to hold the same speed means the brakes are fading. You should slow down and use a lower gear. The need for increased pressure can also be caused by brakes out of adjustment, air leaks, or mechanical problems. You must memorize how the low air pressure warning works. It is not only on the DMV CDL Tests but also a matter of life and death when considering safety. We strongly recommend that you have access to real tractor-trailers to practice using the air brakes. 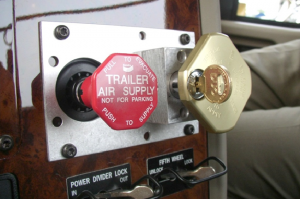 A low air pressure warning signal is required on vehicles with air brakes. A warning signal you can see must come on before the air pressure in the tanks falls below 60 psi. (Or one half the compressor governor cutout pressure on older vehicles.) The warning is usually a red light. A buzzer may also come on. Another type of warning is the "wig wag." This device drops a mechanical arm into your view when the pressure in the system drops below 60 psi. An automatic wig wag will rise out of your view when the pressure in the system goes above 60 psi. The manual reset type must be placed in the "out of view" position manually. It will not stay in place until the pressure in the system is above 60 psi. On a large buss, it is common for the low-pressure warning devices to signal at 80-85 psi. Some older vehicles (made before 1975) have a front brake limiting valve and a control in the cab. The control is usually marked "normal" and "slippery." When you put the control in the "slippery" position, the limiting valve cuts the "normal" air pressure to the front brakes by half. Limiting valves were used to reduce the chance of the front wheels skidding on slippery surfaces. However, they reduce the stopping power of the vehicle. Front wheel braking is good under all conditions. Tests have shown front wheel skids from braking are not likely even on ice. Make sure the control is in the "normal" position to have normal stopping power. All trucks, truck tractors, and buses must be equipped with emergency brakes and parking brakes. They must be held on by mechanical force (because air pressure can eventually leak away). Spring brakes are usually used to meet these needs. When driving, powerful springs are held back by air pressure. If the air pressure is removed, the springs put on the brakes. A parking brake control in the cab allows the driver to let the air out of the spring brakes. This lets the springs put the brakes on. A leak in the air brake system, which causes all the air to be lost, will also cause the springs to put on the brakes. Tractor and straight truck spring brakes will come fully on when air pressure drops to a range of 20 to 45 psi (typically 20 to 30 psi). Do not wait for the brakes to come on automatically. When the low air pressure warning light and buzzer first come on, bring the vehicle to a safe stop right away, while you can still control the brakes. Parking Brake Controls for Air Brakes on Tractor Trailers. YOU Must know how to use both knobs on the left. Tractor Protection Valve Air Brake Component for CDL TEST is always a question that can fail students if they get it wrong. This picture shows actual Tractor Parking Brake Control Knobs from a commercial vehicle cabin. Never push the brake pedal down when the spring brakes are on. If you do, the brakes could be damaged by the combined forces of the springs and the air pressure. Many brake systems are designed so this will not happen. Not all systems are set up the same way. It is much better to develop the habit of not pushing the brake pedal down when the spring brakes are on. CDL Air Brakes Modulating Control Valves. In some commercial vehicles a control handle on the dash board may be used to apply the spring brakes gradually. This is called a modulating valve. It is spring-loaded so you have a feel for the braking action. The more you move the control lever, the harder the spring brakes come on. They work this way so you can control the spring brakes if the service brakes fail. When parking a vehicle with a modulating control valve, move the lever as far as it will go and hold it in place with the locking device. CDL Air Brakes Dual Parking Control Valves. Some vehicles, such as buses, have a separate air tank which can be used to release the spring brakes. When main air pressure is lost, the spring brakes come on. This is so you can move the vehicle in an emergency. One of the valves is a push-pull type and is used to put on the spring brakes for parking. The other valve is spring loaded in the "out" position. When you push the control in, air from the separate air tank releases the spring brakes so you can move. When releasing the button, the spring brakes come on again. There is enough air in the separate tank to do this a few times. Always plan carefully when operating a commercial vehicle's breaking system. Otherwise, you may be stopped in a dangerous location when the separate air supply runs out. You must know the names of the knobs and how they all work. It is extremely important part of being a professional truck driver so get ready to memorize it all and learn it. If you do not learn the air brakes components prior to driving a commercial vehicle you are considered an unsafe driver who needs more training. 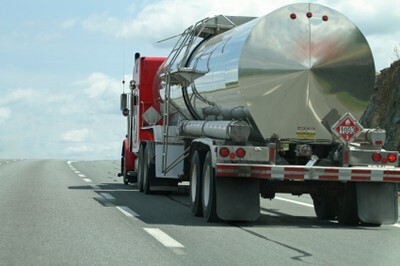 Know that some newer semi's or Semi-Tractor & Trailer's have Anti-lock Braking Systems (ABS). Truck tractors with air brakes or other air brakes vehicles, (trucks, buses, trailers, and converter dollies) are required to be equipped with anti-lock brakes. Many commercial vehicles built before these dates have been voluntarily equipped with ABS. Check the certification label for the date of manufacture to determine if your vehicle is equipped with ABS. Most commercial vehicles use ABS is a computerized system that keeps your wheels from locking up during hard brake applications. Know what ABS is and what it does and be prepared to mention it to the DMV instructor during the walk-around or skills test or pre-trip section of the class A CDL test at the DMV. Vehicles with ABS have yellow malfunction lamps to tell you if something isn't working. Tractors, trucks, and buses will have yellow ABS malfunction lamps on the instrument panel. You must know all gauges and instruments on the instrument panel. Be prepared to point to and discuss what each knob, control switch, lever, pedal, etc. does in the cabin of a commercial vehicle. Trailers will have yellow ABS malfunction lamps on the left side, either on the front or rear corner. Dollies manufactured on or after March 1, 1998 are required to have a lamp on the left side. On newer vehicles, the malfunction lamp comes on at start-up for a bulb check, and then goes out quickly. On older systems, the lamp could stay on until you are driving over five mph. In the case of towed units manufactured before it was required by the Department of Transportation, it may be difficult to tell if the unit is equipped with ABS. Look under the vehicle for the electronic control unit (ECU) and wheel speed sensor wires coming from the back of the brakes. ABS is an addition to your normal brakes. It does not decrease or increase your normal braking capability. ABS only activate when wheels are about to lock up. The computer takes control of braking by rapidly apply brakes pressure. ABS does not necessarily shorten your stopping distance, but it does help you keep the vehicle under control during hard braking. Most notably it helps to keep the tractor-trailer moving in a straight line during hard braking. You may feel a strong vibration on the brake pedal when ABS is engaged. Get the answers to these questions and more by reading this web page and memorizing the pictures and names of Air Brakes components. Be prepared to understand the air brake parts on both the CDL Air Brakes test questions and demonstrated knowledge of the air brakes and how they work on the Road Trip and Skill Test and Pre-Trip sections at the DMV with a certified DMV instructor.